Frustrated and hopeless are the two words that come to mind when trying to abort these crooks from committing the crime they are attempting. I have been notified that someone is pretending to be me and is attempting to commit fraud using my name and a similar email address. My domain is SoundBroker.com and they are using SoundBrokerinc.com They have my address, and federal tax and my duns number. I have attached an email that I just received from someone that was calling me that received the email. Please investigate this and shut these crooks down ASAP before they steal money from some unsuspecting victim. Please confirm receipt of this email. 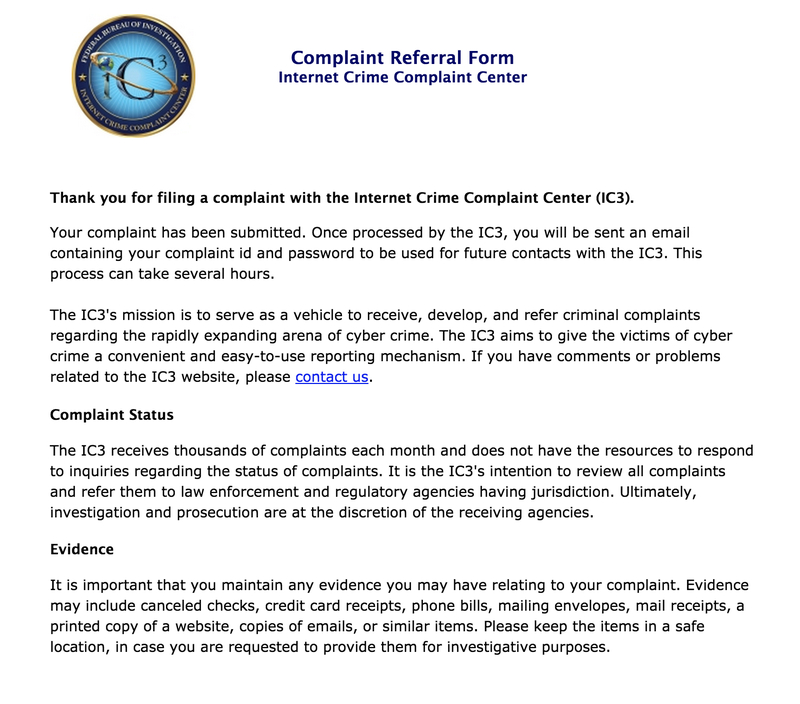 Thank you for filing a complaint with the Internet Crime Complaint Center (IC3). This is the only reply you will receive from the IC3. Because we receive thousands of complaints per week, we cannot reply to every complaint received or to every request for updates. However, once we forward your complaint to investigators in the field, they may contact you for further information. Consequently, it is important that you maintain any evidence you have relating to your complaint. Evidence can include canceled checks, credit card receipts, phone bills, mailing envelopes, mail receipts, printed copies of websites, copies of emails, or similar items. To learn more about Internet schemes and ways to protect yourself visit www.lookstoogoodtobetrue.com. More to follow, if there is more to report…….. 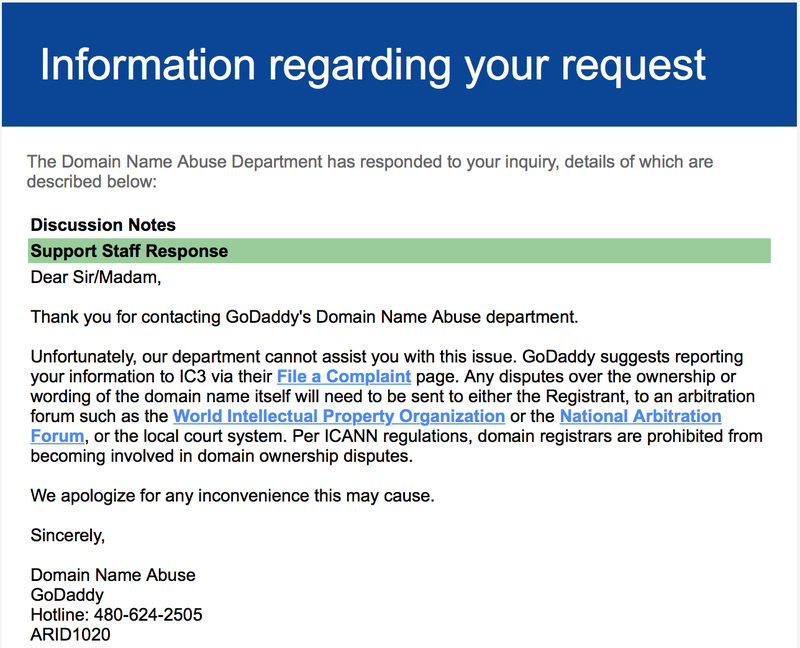 I have already contacted GoDaddy who is the registrar of the fraudulent domain in hopes to shut them down immediately. Ironically yesterday I received a fraudulent request for purchase and here are the steps that I took and what I recommend to prevent fraud when getting an unrequest order. Type the legitimate name of the company into your browser and use the contact information on the web site to call the organization that is supposedly placed the order. NEVER use the information from the email to verify if the order is legit. I highly recommend you be very diligent in your research before trusting and unsolicited request for purchase. If you have any ideas to shut these crooks down and put them in jail where they belong, please leave me your thoughts in the comments. June 2, 2015: That is a very true statement. Another day in Paradise. That is because my office is located in Paradise, NV 89119 – Most people think that it is Las Vegas and I guess that Paradise and Las Vegas are interchangeable. Well now I am off to play tennis in Henderson. I will return tomorrow for another day in Paradise. Where will you be? Just moved my WordPress Blog to JanLandy.com and am hoping that this will finally be the motivation I have been looking for to write a daily or if not daily, weekly, or if not weekly, monthly blog. Lets see what happens. Today is day one. June 1, 2015.